The Reader uses a new touch screen, perhaps the biggest improvement; readers can “swipe” page-turning instead of pressing buttons — annoying on the Kindle, acceptable on the current Sony device. It’s not unlike gestures on the iPhone. Readers can annotate and highlight text with a finger or stylus and save notes for future reading — possibly a great enhancement and differentiator, depending on its execution. 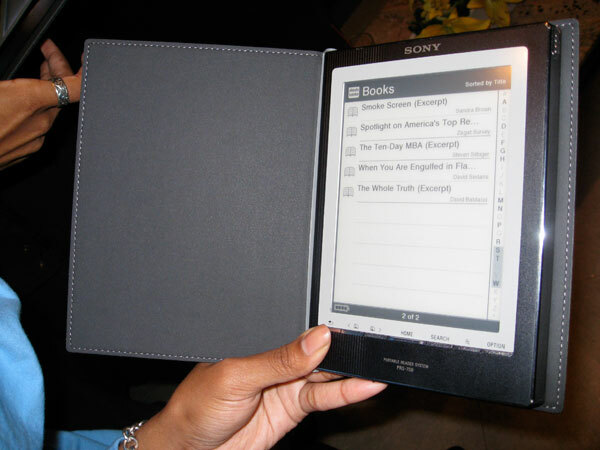 The Reader includes an important feature that has been missing from electronic book devices: a built-in LED that illuminates text in dark settings, which could come in handy when reading in bed. 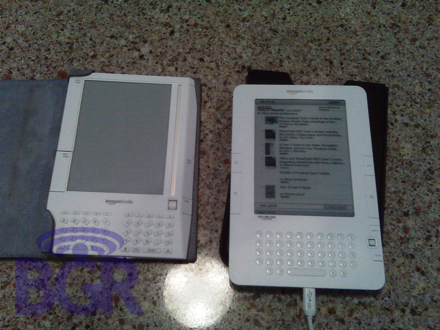 The Reader uses the same E-Ink technology that Sony and Amazon currently use on their readers, but it’s still not color. The display refreshes slightly faster than the previous generation, but its screen refresh wasn’t that bad to begin with. The Reader is slightly smaller but, again, its size wasn’t much of an issue unless Sony’s goal is to shrink its Readers to the size of iPhones. Sony continues to improve the aesthetics of the Reader — this one sports an all-black finish with textured accents that (testers say) feels comfortable in the hand — but, then again, the last Reader wasn’t all that bad-looking (and certainly a heck of a lot more attractive than the Kindle). The biggest disappointment is that the Sony Reader still does not have cellular or Wi-Fi connectivity, which is the main advantage the Kindle holds. Sony has promised this functionality “sometime in the near future,” but when? The $400 price tag is also a disappointment. 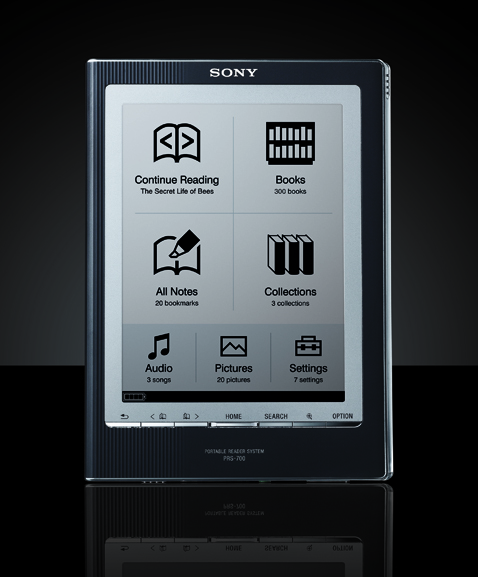 It will cost $40 more than the Kindle and $100 more than the current Sony Reader. The other big advantage the Kindle enjoys is superior access to eBook content through Amazon’s Website. Even so, Sony says it plans to have 100,000 titles available by the holidays and it will revamp its much maligned online bookstore in the next month. Ever so slowly, Sony is improving its Reader, the eBook-reading experience (it’s open to more eBook formats and standards than the Kindle), and its commitment to the electronic book market. If Sony incorporates wireless into a future Reader, look out Kindle. 1) Compaing the number of downloads of a reading device for the iphone and actual sales of kindle doesn’ really capture anything interesting. Reading a proper book on the iphone is a miserable experience and it’s not the future. 2) “The Reader uses the same E-Ink technology that Sony and Amazon currently use on their readers, but it’s still not color.” Ths is listed as an inconsequential improvement when in factit means nothing’s changed. 3) Wireless isn’t that big a whoop. People outside the US can’t use kindle anyway and people are going to be paying as much for ebooks in 5 years as they do now for music.